MONTEREY, CA (September 21, 2016) – Coming into the 2016 racing season, Red Deer, Alberta’s Parker Thompson signed with Cooper Tires USF2000 Championship Powered by Mazda juggernaut Cape Motorsports with Wayne Taylor Racing and was focused on winning races and securing the series championship. Thompson competed in the program’s finale at the 2.238-mile, 11-turn Mazda Raceway Laguna Seca finale on September 9-11, wrapping up a tremendous season of growth that featured four wins and 12 podium finishes. The 18-year-old series sophomore entered the last race of the year just 18 points behind his teammate Anthony Martin in the fight for the title, but both Parker and Anthony would turn in stellar weekends with second and third place finishes, meaning that Thompson was not able to make up the necessary ground in the chase. It was a tough pill to swallow for the talented young driver, but the positive is that he is more determined than ever to find the funding for next year to continue his already successful open wheel career. 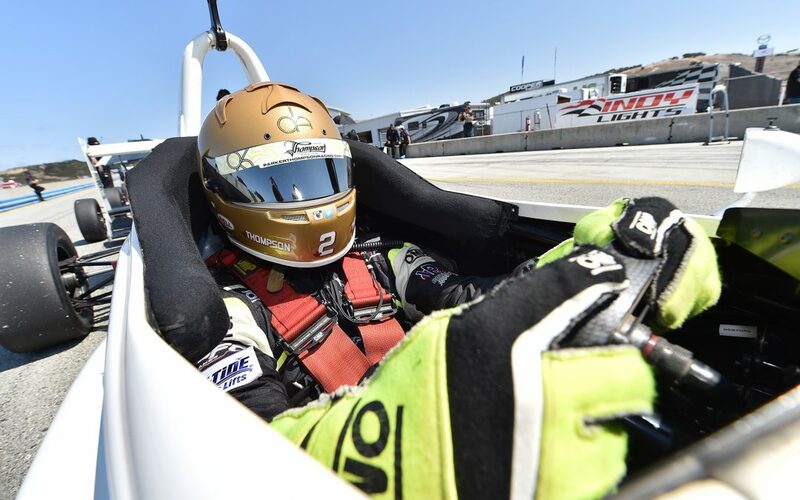 Parker has been a frontrunner all year long and nothing changed when he hit the track at the iconic Mazda Raceway Laguna Seca on Friday in his #2 Weyburn Energy Van Diemen for two rounds of practice. Thompson was in the top-three all weekend, and after sitting down with his team between each session, they were able to develop a great set-up for the challenging racetrack. Parker laid down the third quickest time during the qualifying session, putting himself on the inside of the second row for the start of both races. In the opening race, he chased Martin for the first half of the event as the duo ran second and third to Victor Franzoni, but Parker was determined to gain points on his championship rival. Halfway through the race, Parker made a tremendous move in turn five to slip underneath Anthony and take over the second position, which he would hold through to the checkered flag, chipping three points out of the lead in the overall standings. In the second race of the weekend, and the final event of the year, Parker needed to get aggressive to make something happen, and he drove his car deep into the opening corner looking to take the lead. The car pushed a little as he turned in, but he was able to get the car rotated, but not quite enough to overtake the polesitter or Martin. Parker slotted into third and once again set about pressuring Martin into a mistake, but both pilots drove without a mistake, leaving Parker to finish third. The end result was a stellar second place in the overall series championship, and the gain of a wealth of knowledge and experience that will prepare him for whatever is to come in 2017.